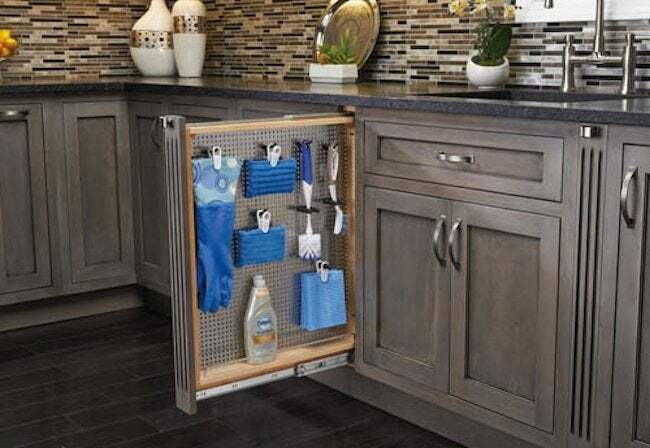 In a kitchen with scant storage, a pullout organizer offers a space-smart way to put every last inch to good use. In nearly every kitchen remodel that involves cabinets of standard dimensions, you’re left with at least one gap between a cabinet and a wall (or a major appliance). You can always live with the void, but if yours is a small kitchen, you probably want to capitalize on every spare inch. I recommend installing a pullout organizer. These versatile, nontraditional kitchen storage options fit into spaces as slender as three inches. The narrowest organizers are perfect for such things as spice jars and cutting boards. Wider pullouts accommodate deeper items you want to keep within easy arm’s reach (for example, pans). No matter the width of the pullout—whether it’s five, six, or nine inches—stored items are accessed not by opening a door and reaching in, but rather by drawing the panel out. The first step is to secure the pullout in place. Having rested the pullout on the cleat I’d put on the rear wall, I proceeded to fasten the pullout to the side of the adjacent cabinet. 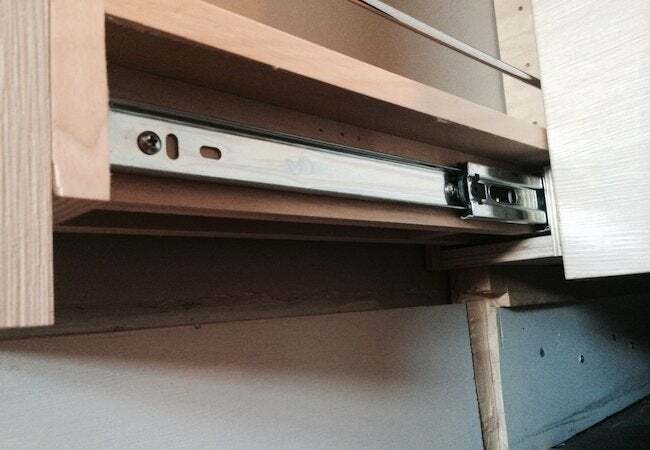 (Don’t use screws that are so long that they interfere with the sliding action.) Be sure to recess the pullout to a depth that equals the width of the cabinet sheet material. 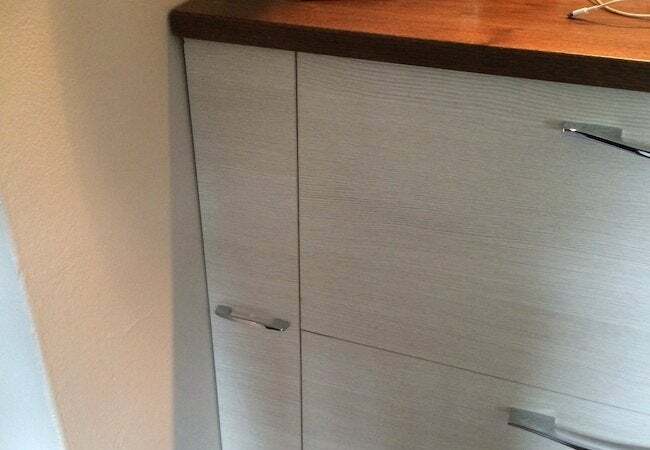 That way, when you attach the cabinet front later in the process, the pullout sits flush with the surrounding cabinetwork for a seamless result. Anticipating that the cabinets would leave a gap—and that I’d want to fill the gap with a pullout—I made sure to order extra sheet material along with my cabinets. I knew that some of the sheet material would be needed to create a front for the pullout that would match the cabinets I was installing in the kitchen. Cut yours to the appropriate width using either a table saw or a circular saw and guide. In the picture above, you can see my simple setup for making the cut with the latter tool. This is an optional step, but I think it’s worth doing, not only for aesthetics, but also to protect the wood. 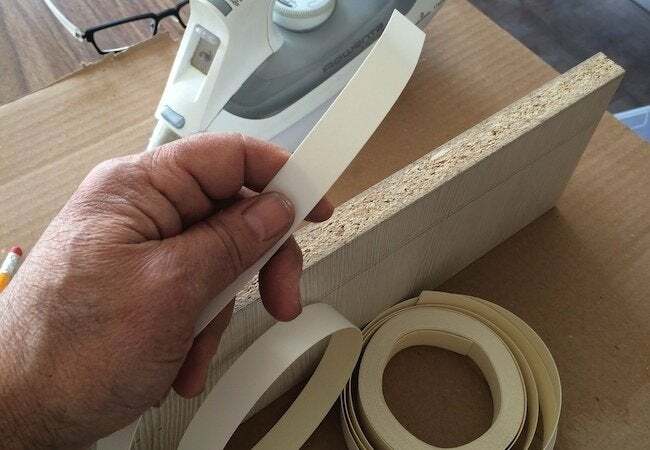 Adhere the banding tape to your cut edges with a clothes iron; the heat activates the factory-applied tape adhesive. 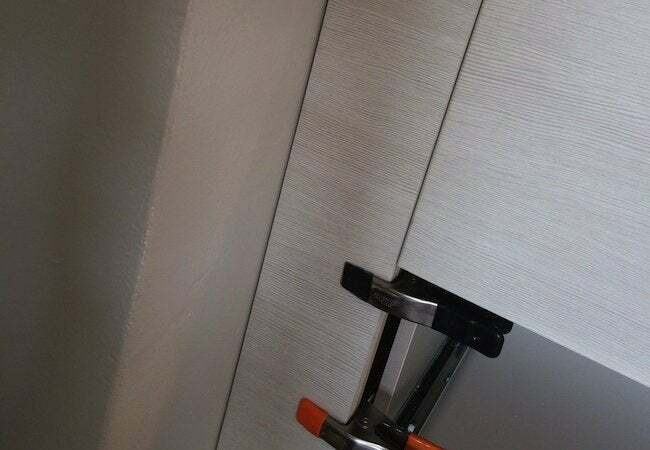 If it’s not available through your cabinetmaker, banding material can be found at your local home center. Eliminate sharp edges and excess material by sanding the newly taped portions of the workpiece with fine-grit paper. 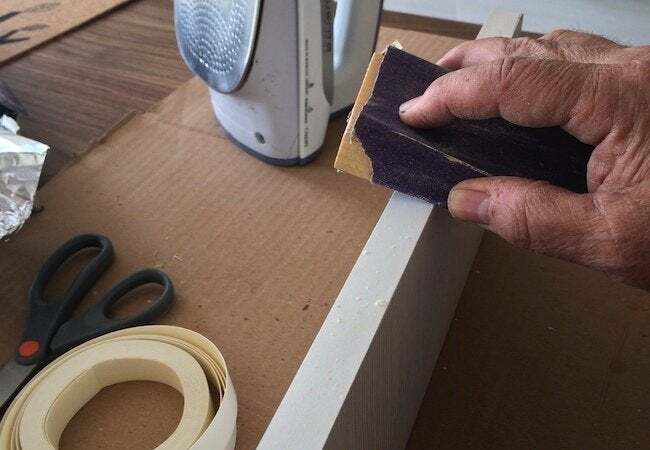 For best results, use a sanding block. 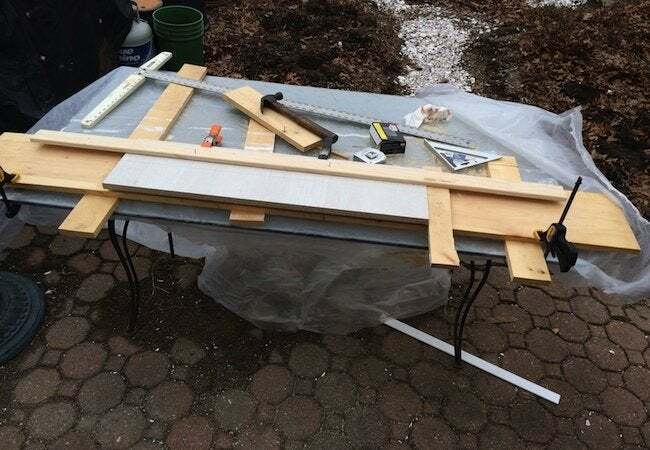 Prior to attaching the workpiece to the frame of the pullout, use clamps to position the panel in the gap. Drive screws from the inside so as not to mar the facade. As you can see, I outfitted the pullout front with hardware that complements the style of my cabinet pulls. What’s most satisfying for me, though, is that the pullout area sits perfectly flush with the adjacent drawers. Not only that, but—crucial to a professional-looking result—the seams at the sides of the pullout are the same width as the seams between the drawers. The pullout has been installed now for two months, and I can report that second only to the silverware drawer, it’s the most-used storage space in our kitchen.